How much do you love candy? Do you lose your mind whenever it’s around? It’s our secret weakness, and we aren’t ashamed to admit that. We get a tad bit dizzy, go a little wobbly in the knees, until it’s all gone. What we’re saying is that we could use a little restraint. A Maximum Restraint Mask, that is. This is pretty much the perfect mask for two types of people. 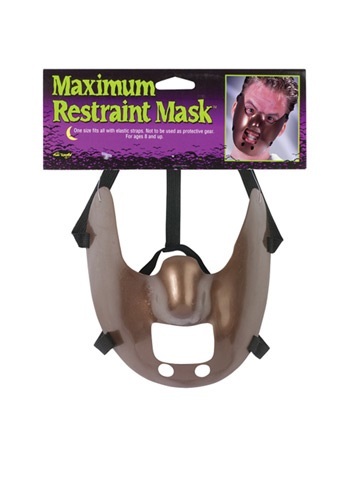 First, anyone dressing as Dr. Hannibal Lecter from The Silence of the Lambs. Add a straight jacket and maybe a padded furniture dolly and you’re good to go. But this is great for a second type of person, the secret candy eater. Because the square hole in this mask is the perfect size for candy! This is a plastic mask with elastic straps. Sure, it’s a mask made for maximum restraint but it’s actually pretty comfortable. Comfortable to eat candy in, that is!